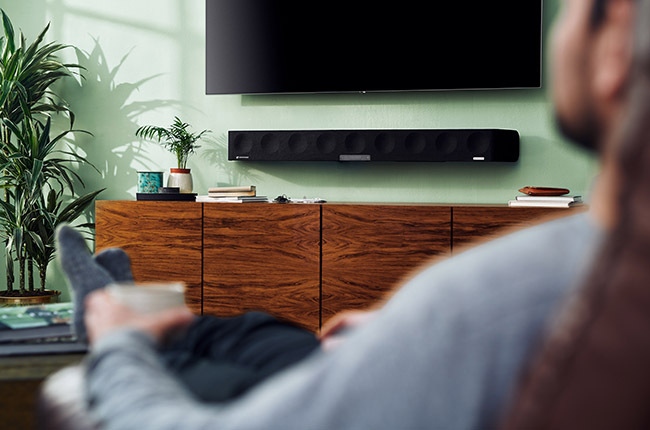 Sennheiser AMBEO Soundbar - - The new AMBEO Soundbar from Sennheiser has been created by audio specialist Sennheiser to be the world’s best soundbar: it uses state of the art acoustic technology to place you inside the sound experience with incredible realism. 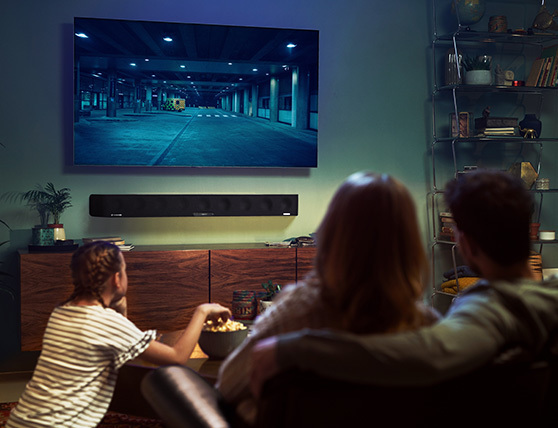 Thanks to the unique AMBEO 3D technology, the new sound bar creates a remarkable spatial sonic experience, providing immersive 5.1.4 sound and deep bass that has to be heard to be believed. All this from a single all-in-one device – and without the need for an additional subwoofer. Hear it to believe it. Thanks to unique AMBEO 3D technology, the new Sennheiser AMBEO Soundbar delivers an unparalleled sonic experience. With the new AMBEO Soundbar, the 5.1.4 home entertainment experience is brought into one single device. With the AMBEO Soundbar, we are bringing the 5.1.4 home entertainment experience into a single all-in-one device. Combining the latest in virtualization technology with audiophile-grade sound, the AMBEO Soundbar is a new reference for TV, movie, and audiophile music enjoyment at home. How is your soundbar different from other soundbars on the market? •	State-of-the-art 3D sound reproduction: AMBEO virtualization technology creates what we believe to be the best 3D sound that can be reproduced by a single device. 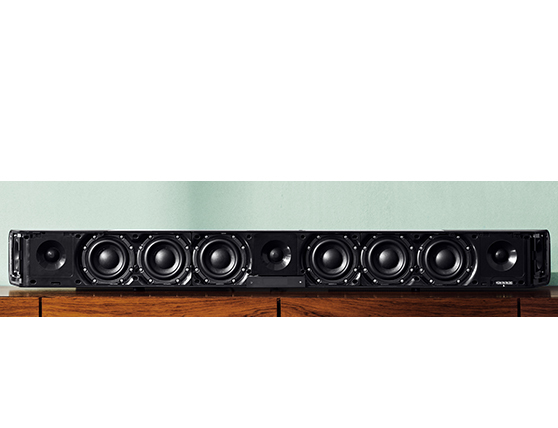 •	Best-in-class bass playback: The soundbar features six proprietary 4-inch, long-throw woofers that achieve incredible bass reproduction without an external subwoofer. How does this work? How do you create this 3D sound? Working with 32-bit processing, the innovative AMBEO 3D technology virtualizes all available content. 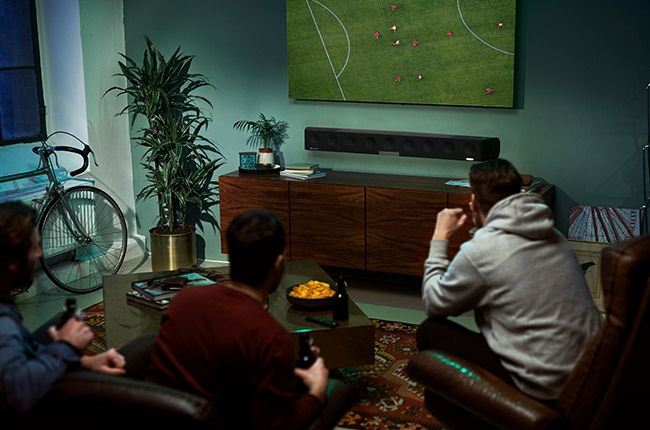 The AMBEO Soundbar uses reflections off the walls to virtually position speakers in the room by calibrating its acoustics based on the room characteristics and the individual seating position. Therefore, the listener receives sound information from all directions. Why do you work with room calibration? Apart from the proprietary acoustics of the AMBEO Soundbar itself, the individual room is a crucial factor for reproducing 3D sound with a single device. As this soundbar uses wall reflections to virtually position speakers in the room, it requires an exact calculation and room-based adjustment of the acoustics. What if my AMBEO Soundbar is not positioned in the center of the front wall? Obviously most living rooms do not offer perfect square characteristics. For that reason, the automatic room calibration feature provided with the AMBEO Soundbar is necessary to adapt the acoustics to the surroundings and successfully co-work with the reflections off the wall. Working with that, this soundbar can neutralize bad room characteristics to a limited degree. What if my living room doesn’t provide perfectly square dimensions? What should be the maximum size of the room? The best acoustic results occur with 5 meters to each side, meaning up to 5 meters to the left wall, to the ceiling, and to the right wall. However, if there are any walls that are further away, reflections will still work but they may be slightly delayed. Is the AMBEO Soundbar also connectable to any voice assistants? 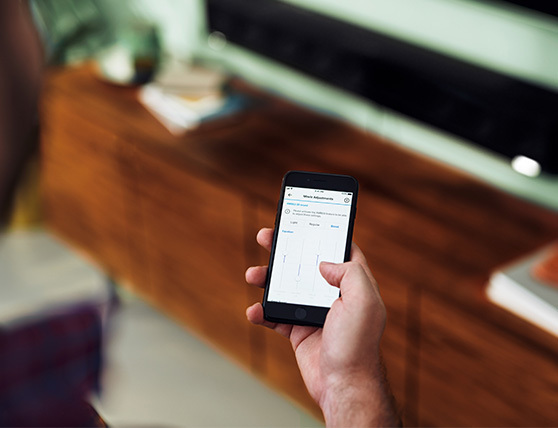 Yes, this soundbar offers Google Chromecast functionality which allows you to connect it to the Google Voice Assistance. 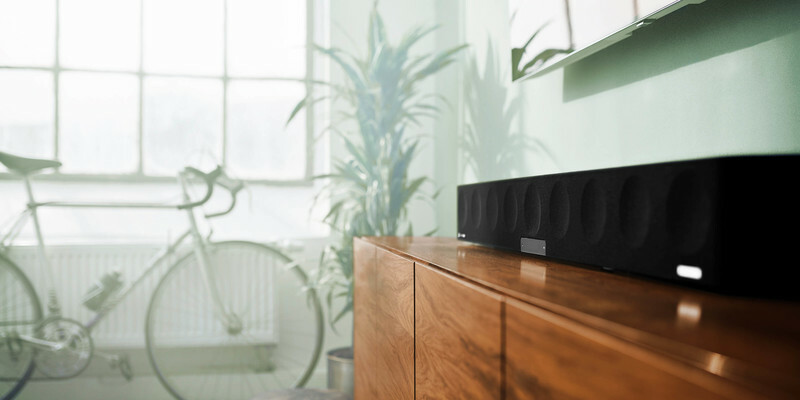 With any Google Voice-enabled speaker or smartphone, this soundbar can be controlled by voice. Which codecs does this soundbar support? The AMBEO Soundbar is compatible with the 3D audio formats Dolby Atmos®, MPEG-H and DTS:X™. Beyond this, it also features upmix technology, which recreates stereo and 5.1 content as a thrillingly immersive 3D sound experience.